New York Sl. l.ouis. San Francisco. DusseIdorf. London Mexico Sydney . Toronto Book design by Judith Michael. 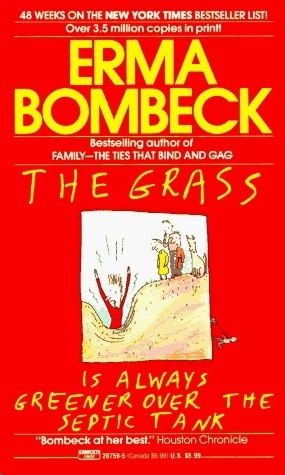 Copyright © 1972, 1973, 1975, 1976 by Erma Bombeck. All rights reserved. Printed in the United States of America. No part of this publication may be reproduced, stored in a retrieval system, or transmitted, in any form or by any means, electronic, mechanical, photocopying, recording, or otherwise, without the prior written permission of the publisher. Bombeck, Erma. The grass is always greener over the septic tank. Lot No. 15436 . . . Where Are You? Who's Watching the Vacant House? Everyone. Soon after the West was settled, Americans became restless and began to look for new frontiers. Bored with the conveniences of running water, electricity, central heating, rapid communication, and public transportation, they turned to a new challenge . . . the suburbs. News of the discovery of a septic tank spread and within weeks thirty million city dwellers readied their station wagons and began the long journey to the edge of town in search of a bath and a half and a tree. It wasn't easy for the first settlers. They planted trees and crabgrass came up. They planted schools and taxes came up. Surveyors planted stakes and they disintegrated. There wasn't a day that went by that they weren't threatened by forces from the city: salesmen of storm doors, Tupperware and Avon ladies, traffic lights, encyclopedia salesmen, Girl Scout cookie pushers, and Golden Arches everywhere. The survival by at least one family of PTA's, garage sales, car pools, horse privileges, Sunday drivers, Little Leagues, and lights from the shopping center is what this book is all about. It traces the migration of the Bombeck family from their modest—but pathetic—apartment in the heart of the city to a plat house (one original and 216 carbons) just outside the city limits. , They make the trip with a son who has spoken four words in five years (“I get the window”), their daughter who sleeps with a baton, and a toddler who has never known anything but apartment living and consequently does not own a pair of hard shoes. It took a week to load their station wagon and after the good-byes they settled back to enjoy their new adventure. "Mom! Andy took a bite out of a cookie and put it back. go, according to this map." simple scale on a map." “It won't be long now!” he said. The Bombecks made it to the suburbs in their station wagon on June 9th. It was the longest fifty-five-minute drive any of them had ever endured. STATION WAGONS . . . HO! It was logic like this that attracted thirty million settlers to the suburbs following World War II. My husband held out against migration for as long as he could. Then one day we heard from our good friends, Marge and Ralph, who, together with their two children, set out in one of the first station wagons to a housing development thirty miles south of the city. As Marge wrote, "We reached the suburbs on the 14th. There was no water and no electricity in our house so we had to hole up in a Holiday Motel for three days. The pool wasn't even heated. "The yard is barren and there are no sidewalks. Mud is everywhere. There is no garbage pickup, our old stove won't fit in tin' now hole, and the general store has never heard of Oregano. "We have aluminum foil at the windows to keep the sun from fading the children. I feel like a turkey. We have to claim our mail at the post office a mile and a half away. There is no super. We have our own washer and dryer which don't require quarters. I understand, however, that at the end of the month, there is something called a utility bill that is presented to us. “Doesn't that sound exciting?” I said, jumping to my feet. I looked around. I had to iron in the playpen. The kids were stacked in a triple bunk at night like they were awaiting burial at sea. If the phone rang, I had to stand on my husband's face to answer it. The dog slept under the oven, next to the crackers. And one day I yawned, stretched my arms and someone stored the complete works of Dr. Seuss and a pot of African violets on them. stockings for as long as two hours." The selling of the suburbs made the coronation of Queen Elizabeth look like an impulse. On a Sunday afternoon you could tour Cinderella's Red Coach Farms, Mortgage Mariana, Saul Lieberman's Bonsai Gardens, or Bonaparte's Retreat (“Live the Rest of Your Life Like a Weak King”). Every development had its gimmick: flags flying, billboards, free rain bonnets, balloons for the kiddies, and pom pom girls that spelled out low interest rates in script. My husband spread out the newspaper and together we went over the plats we had visited. “What did you think of Tahitian Village?” he asked. The sales office of Sherwood Forest was a tree stump surrounded by five or six salesmen dressed in tunics. Nearby was a plastic campfire that held a plastic pig on a spit and beyond thatl were 800 plastic houses. “You're standing over it,” he said, staring at my knees. My husband picked up the price list. “You'll find that it is in keeping with the Robin Hood philosophy,” he smiled. We bolted toward the car, pursued by six Merry Men. The adventure of moving to the suburbs had nearly worn off when we stumbled into Suburbian Gems. “How much are the houses?” asked my husband. “You understand, this is only the model home,” said the salesman. The double doors opened and our voices echoed our ploiisurn in the house, from the huge foyer to tho curved stairway leading to the second floor. Then, inside the living room, I saw it—the fireplace. A warmth came over me. I could see my husband standing against it in a sports coat with leather patches on the elbows holding a brandy and a copy of Emerson's essays. I visualized me hanging a della Robbia wreath over it at Christmas and laughing children basking in its reflection after a snow. “We'll take it,” I said suddenly. As my husband lifted his hand to touch my face in a gesture of love, he was amazed to find a pen in it. I squeezed my husband's arm as he signed the agreement. “Oh, then you want the model with the fireplace?” asked the salesman. “We like everything,” I said. “How small?” asked my husband. “But the Pee Wee does have the pillars and the porch ...” I asked anxiously. “I told you, it has everything except a second story, stairway, entranceway, and extra lot. Now, that covers about everything except what you want to do about the garage.” . “What about the garage?” asked my husband. “But everything else is included in the original price?” asked my husband.
' 'Do you have some way of getting up there or do you want us to install a pull-down stairway as an extra? Let's see— apart from the paint, floor covering, spouting, storm windows, kitchen hardware, countertops, lighting fixtures, and keys, which are all extra, I think that does it." Out of the corner of my eye, 1 saw him add, “Pen @ 59 cents” bringing the total to $29,500.59. We must have driven two and a half hours before we found our house. “Are you sure this is it?” asked my husband. “But it does have pillars,” I said, pointing toward the four supports that looked like filter-tip cigarettes. “Will they grow?” asked our son. “They're mine,” said a woman coming out of one of the bedrooms. “Who are you?” asked my husband. “I live here,” she said. “Isn't this 5425 Ho Hum Lane?” he asked. “That makes a lot of sense,” I said. “I suppose so,” she said, “but the other night it was embarrassing. My husband and I went out to dinner and there was a huge line so Russell (my husband) slipped the maitre d' $2 and said, ”I think if you'll check your reservations, you'll find we're next. You came personally recommended." As we continued the search for our new home, I expressed some concern that every time we left the house we'd have to leave a kid on the front porch for a landmark. “How much landscaping comes with the house?” I asked. We turned the key in the door. My husband and I raced through the house to the backyard to get a glimpse of the flatbed truck and the lift that would turn our barren patch of mud into a jungle. The yard was empty. “Where's the shrubbery?” asked my husband. “On the dining room table with the mail.” We stood around the table. No one spoke as we viewed the envelope holding five maples, eight taxus, six evergreens, two ash, four locust, 109 living rose hedge plants, two flowering mother-in-law tongues, and a grove of fifteen assorted, colorful fruit trees.